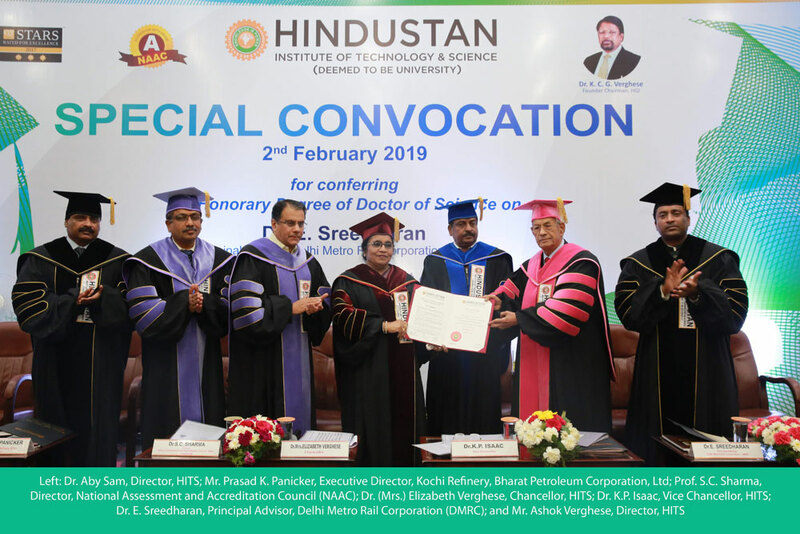 The Special Convocation of Hindustan Institute of Technology and Science (HITS)for Conferment of Degree of Doctor of Science (Honoris Causa) to Dr. E. Sreedharan, Principal Advisor, Delhi Metro Rail Corporation (DMRC) was held on 2 February 2019. Chief Guest, Prof. S.C. Sharma, Director, National Assessment and Accreditation Council (NAAC); Guests of Honour,Mr. Prasad K.Panicker, Executive Director, Kochi Refinery, Bharat Petroleum Corporation, Ltd;andDr. E. Sreedharan, Principal Advisor, Delhi Metro Rail Corporation (DMRC);Dr. (Mrs.) Elizabeth Verghese, Chancellor, HITS;Dr. Aby Sam,Director, HITS; Mr. Ashok Verghese, Director, HITS; Dr. K.P. Isaac, Vice Chancellor, HITS were present at the function. 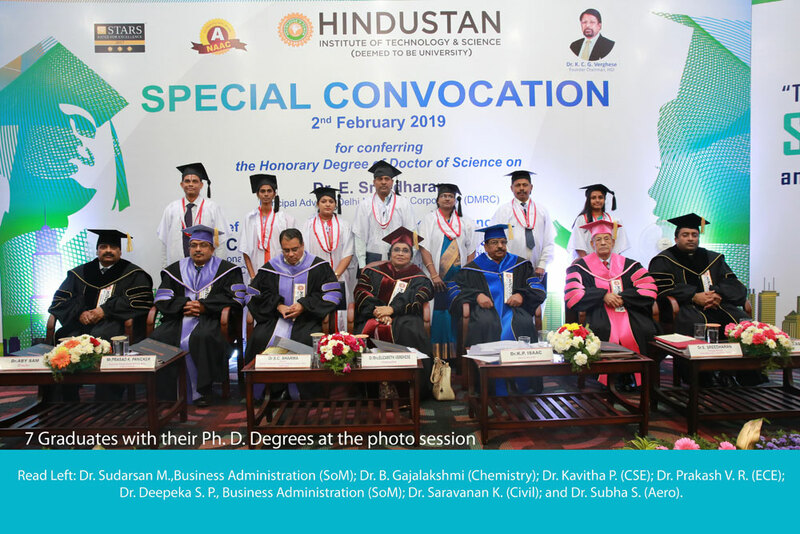 7 Ph.D. graduands were privileged to be awarded their degree at the event amidst the most celebrated guests. Dr. K.P. Isaac’s address marked the improvement of HITS in all expansesincluding the recent rankings of QS BRICS under 301-350 band and NIRF between 101-150 band, introduction of Project Based Learning System, and achievements such as ‘Jaihind 1S’-the World’s Lightest Microsatellite (33.39g) and ‘Asia’s First Flying Two Wheeler’ that are recorded in India Book of Records. He also sensitized the institution’s contribution towards the victims of natural disasters as in the case of Kerala Floods and Gaja Cyclone at Tamil Nadu that have devastated both states leaving a huge loss. Dr. (Mrs.) Elizabeth Verghese emphasized the need for persistent learning approach keeping morality and ethics in mind. Reflecting on Research, she said, “Research is vital to our country’s progression and lead a life devoid of poverty. Only learning embedded with research can propel an institution to greater heights.”Dr. Elizabeth was atgreat acclaimfor Dr. Sreedharan’s remarkable career and his contribution in modernizing the face of India’s public transport system. She persuaded the young learners to understand and emulate the virtues observed in him. 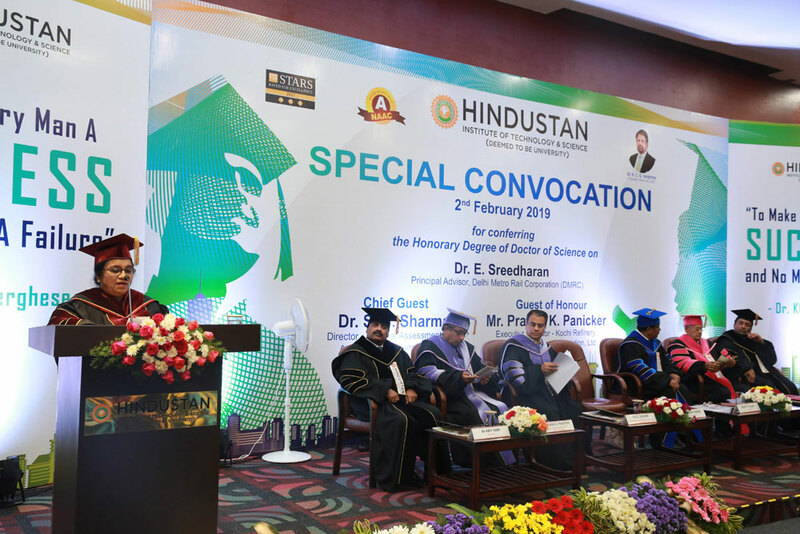 The most-awaited talk of Dr. E. Sreedharan saw his expression of gratitude on being conferred with Honouris Causa. “All great achievements are not individual centric; but efforts of a team,” said Dr. Sreedharan. 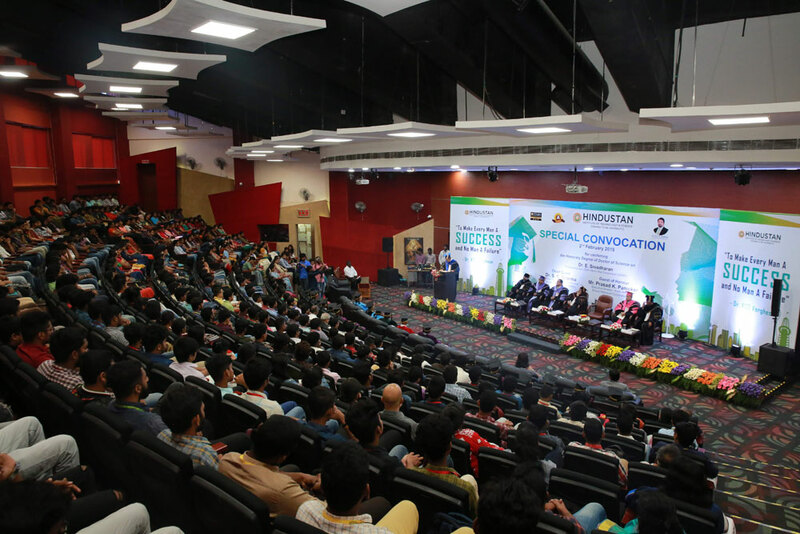 He correlated the saying with his team of Engineers, Consultants, Contractors, Suppliers and many more; and shared the respect of the honorary award with them. 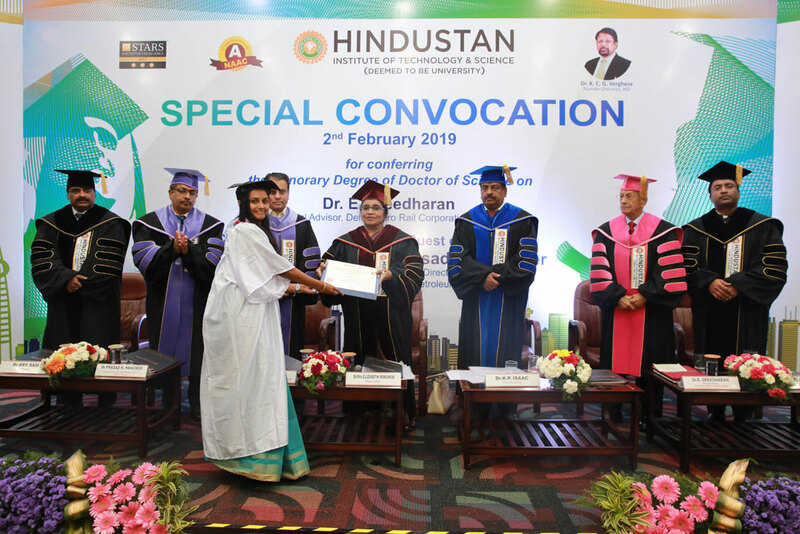 Pointing at Vellore’s Christian Medical College’s service record, Dr. Sreedharan voiced that irrespective of one’s impediments, success can be attained through persistent efforts and earnest dedication. He insisted to pursue learning at all aspects of life; to him, it is never ending until one willingly does. If excelling as a technocrat with knowledge is appreciative, owning a true character would demand appreciation from all. “Crown and glory of life is Character” says Dr. Sreedharan. The talk concluded addressing student community to uphold ethical values, principles, and culture in par with any other achievement. Dr. S.C. Sharma in his Special Convocation address referred a technocrat as both technician and a practitioner. He drew comparison between the concept of episteme and technology based on what Aristotle has quoted; and said man is the most-handicapped species. Since man cannot fly as a bird or run like a Cheetah, he designed technology to make up everything he lacked and gave easy access even to indeterminate things. “Technology or technological products are designed to make life easy and beautiful”, says Dr. Sharma. With novel inventions enabling humans consume less time, mankind must dedicate time to accomplish worthy things like involving in painting, dancing, writing etc. as they are the real signs of higher activities of life. Mr. Prasad K. Panickarin his address recalledhis fond memories of attending one ofthe public lectures of the Late Dr. K.C.G. Verghese, Founder, Hindustan Group of Institutions. He owed his gratitude to Dr.Sreedharan for aiding his team revive the lost spirit over a challenge they once had to face at Bharat Petroleum and plung back to work. Mr. Panickarwas very much conscious of the uncertain implications of Artificial Intelligence (AI) andDigital Technology on the job prospects for the upcoming generation of engineering world. 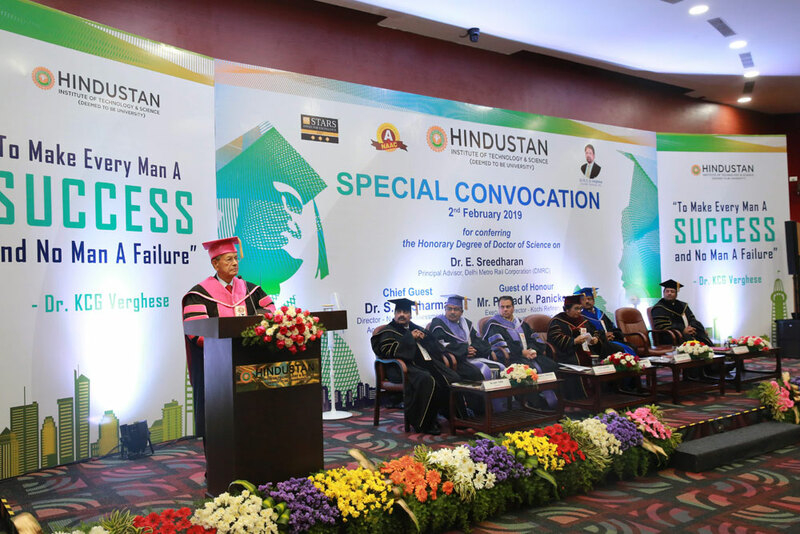 In fact, he unravelled the uncertain future of Bharat Petroleum Company as a case study to ascertainthe upcoming interference of AI and Digital Technology in our conventional job world. The closure of the event was marked with photo session and a standing ovation for the highly much-admired dignitaries.